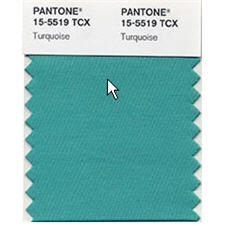 Pantone recently announced that PANTONE 15-5519 Turquoise is their color of the year for 2010. Pantone are the company who created a system for identifying, matching and communicating colors. Pantone books of colors are used by graphic designers, fashion designers, interior designers and just about any one who uses color in their profession. They are heavy hitters in the world of color and their choices are influential. 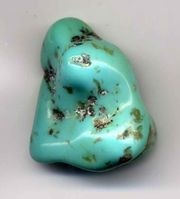 In many cultures, Turquoise occupies a very special position in the world of color, It is believed to be a protective talisman, a color of deep compassion and healing, and a color of faith and truth, inspired by water and sky. Through years of color word-association studies, we also find that Turquoise represents an escape to many – taking them to a tropical paradise that is pleasant and inviting, even if only a fantasy. Color experts at Pantone say that the turquoise color can be used as a colorful yet calming influence in home decor and as an accent in clothing. If youâ€™re getting married and want to be trendy with your color choices, the experts are pointing out how well it offsets white. If youâ€™re thinking about using turquoise on your website, the RGB value is 64, 224, 208. This is not an exact match for Pantone 15-5519, but it is a nice calming blue-green. And in case you were wondering, Pantoneâ€™s 2009 color of the year was the â€œwarm and engagingâ€� Mimosa Yellow â€“ Pantone 14-0848. To read more about Pantoneâ€™s choice, check out the statement on their site. Will you be using Turquoise on your web site in 2010? What will your color for 2010 be?